FIGURE 1: Polyether foam – efficiency in MVSS 302. FIGURE 2: Polyether foam with 6 php flame retardant – fogging A (3 h at 212 °F/100 °C). FIGURE 3: Polyether foam with 6 php flame retardant – fogging B (16 h at 212 °F/100 °C). 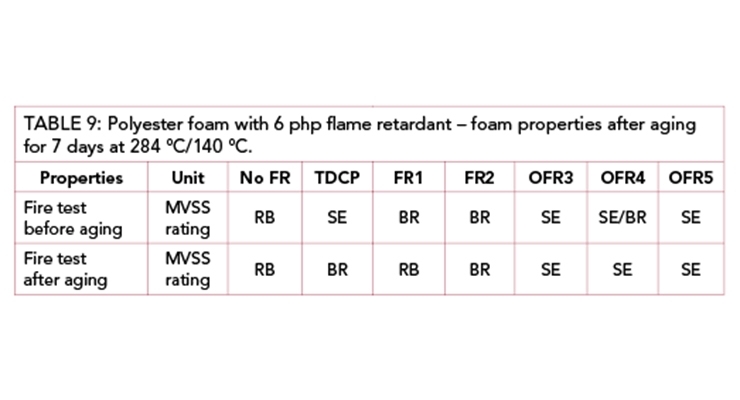 FIGURE 4: Polyether foam with 6 php flame retardant – TVOC (VDA 277). 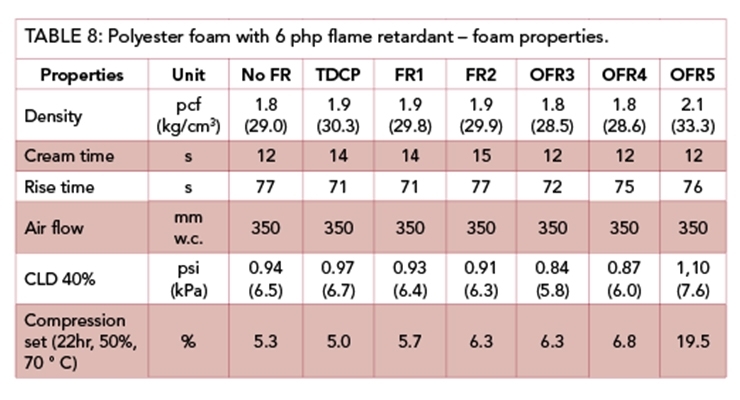 FIGURE 5: Polyether foam with 6 php flame retardant – emissions from flame retardants (VDA 278). FIGURE 6: Polyether foam with 6 php flame retardant – change in color after aging for 3 hours at 356 °F/180 °C. 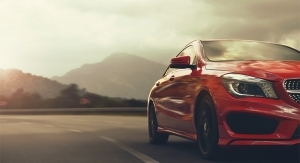 There is a growing interest in new flame retardant solutions for flexible polyurethane foams in automotive applications due to increasing OEM requirements such as lower emissions, enhanced aging properties and improved toxicity profiles. Different concepts can be used in order to address these requirements. 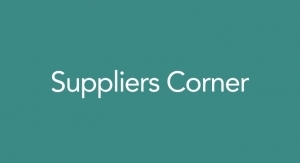 In this presentation the pros and cons of these concepts (e.g., polymeric or reactive flame retardants) are discussed in general. In addition, new phosphorus-based flame retardants are presented and the performance of these products in flexible polyurethane foam is compared to other established flame retardants. Within the scope of the comparison, the effectiveness of these flame retardants in polyether as well as in polyester formulations in MVSS 302 fire test is demonstrated. Furthermore the impact of the different products on processing, foam properties and fogging/emissions is discussed. The results demonstrate that the new flame retardant solutions can help to match the increasing requirements for flexible automotive foams. The global, flexible, polyurethane foam industry faces new challenges regarding flame retardants (FR) driven by increasing requirements from the automotive industry. These requirements include different subjects. • More automotive OEMs require higher quality standards for interiors, especially lower emission levels. Therefore, more stringent emission tests (e.g., VDA 277 and VDA 278) have been introduced by individual OEMs in the previous years. • The life time of vehicles has been extended significantly in recent years and, thus, OEMs have introduced individually enhanced aging standards for car interiors. • Fire standards have partly been tightened for vehicles, e.g., in today’s industry more OEMs request passing the UL 94 V standard instead of MVSS 302 for components used in the engine compartment. 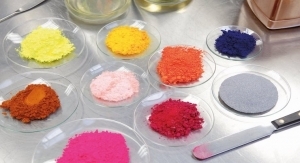 • The automotive industry is looking for materials with improved toxicity and eco-toxicity profiles. This also implies additives such as flame retardants and is reflected in constantly updated substance lists (e.g., GADSL list1) and debates about certain chemicals. Thus, a growing interest for new flame retardant solutions for flexible polyurethane (PU) foams in automotive applications is expected in order to comply with these increasing requirements. 4. Incorporation of flame retardants with reactive groups into the PU foam. Each of these technologies have their individual pros and cons (Table 1) with regard to flexible PU foams. Examples of additive, polymeric and reactive flame retardant technologies are compared in this paper in order to review the above listed pros and cons in flexible PU foam specifically for automotive applications. The concept of solid flame retardants is not considered in this paper because the polyurethane foam industry commonly uses liquid raw materials due to the existing processing equipment. Tris(1,3-dichloroisopropyl)phosphate (TDCP, purity 95%) was supplied by ABCR Chemicals, Germany. Disflamoll® 51092 (FR1), Levagard® TP LXS 51114 (FR2), Levagard® TP LXS 51078 (OFR3), Levagard® TP LXS 51135 (OFR4) and a reactive lab product (RFR5) were supplied by LANXESS Deutschland GmbH, Germany. All flame retardants were used as received without any alteration. The following methods were used to generate the data presented. All foams were prepared in paper-lined boxes on a lab scale according to the following standard procedure. The polyol was weighed, then water and stabilizer were added and the mixture stirred for 15 s with a high speed mixer. The flame retardant was added and the mixture again stirred for 15 s. Afterward the catalysts were added and the mixture stirred for 15 s once again. Then the pre-weighed TDI was added and the mixture stirred for an additional 10 s. The mixture was poured into the box. After the setting, the foam was stored in an oven at 140 °F/60 °C for 15 min to finish the curing. After 24 h at room temperature the foam was cut. The cream and rise times of each formulation were recorded in order to characterize the reactivity of a formulation. The fire performance of the foams was tested according to FMVSS 302. All test specimens had a thickness of 0.51 in./13 mm. 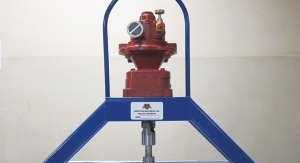 Foams with a flame spread less than 4 in./min or 100 mm/min passed the test and were classified with BR (burning rate). Foams where the flame extinguished before reaching the starting mark were classified as SE (self-extinguishing). Fogging values were measured according to DIN 75201. In method A, the fogging is measured after 3 h storage at 212 °F/100 °C via optical transmission. In contrast, fogging in method B is measured gravimetrically after 16 h storage at 212 °F/100 °C. Emissions were tested according to VDA-277 as well as VDA-278. Compression load deflection at 40% was measured according to DIN EN ISO 3386. Tensile tests were performed according to DIN EN ISO 1798. Compression set (22 h, 50%, 158°F/70°C) was measured according to DIN EN ISO 1856. Air flow is measured as back pressure in mm water column in values up to 350. The lower the value the more open the foam (a foam with 350 is closed). Foam samples (3.1 x 3.1 x 0.6 in./8 x 8 x 1.5 cm) were placed in a convection oven and heated for 3 h at 356 °F/180 °C. After 24 h at room temperature the discoloration (or scorch) of the foam was analyzed via a colorimeter, using an unaged foam as standard. The colorimeter assigns three color characteristics: lightness (L), redness or greenness (a) and yellowness or blueness (b) of the foam. From these values the total color difference (dE) is calculated: dE = (dL2 + da2 + db2)0.5. 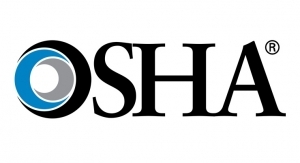 Polyether and polyester foam samples were aged for 7 days at 284 °F/140 °C in an oven according to ISO 2440. Furthermore, polyether foam samples were aged for 5 h at 248 °F/120 °C (3 cycles) in an autoclave according to ISO 2440. Polyester foam samples were aged for 3 hours at 221 °F/105 °C in an autoclave according to ISO 2440. 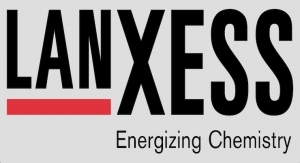 The performance of four new phosphorus-based flame retardants developed by LANXESS was compared in flexible polyurethane foams with two established flame retardants in this evaluation. This includes a new phosphorus-based compound (FR2), two new oligomeric alkyl phosphates (OFR3 and OFR4) and a new reactive phosphate ester (RFR5) with a mean functionality of 1.5. A chlorinated phosphate ester tris(1,3-ichloroisopropyl)phosphate, known as TDCP, and a butylated triphenyl phosphate (FR1) were used as benchmarks. The physical properties of these six flame retardants are summarized in Table 2. 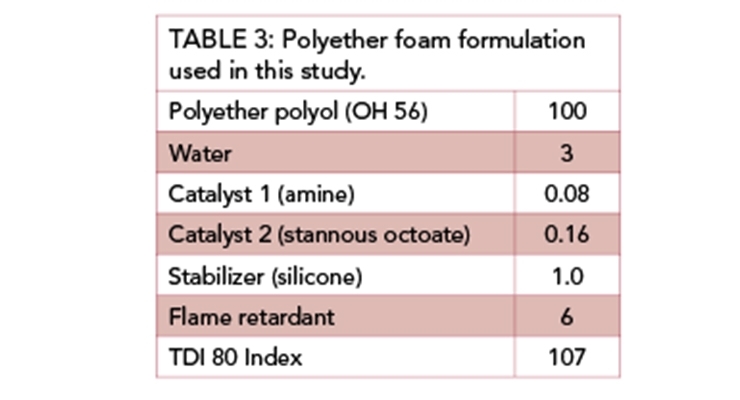 All six flame retardants were tested in a standard polyether foam (Table 3) for automotive applications. The amount of isocyanate was adjusted when the reactive flame retardant RF5 was used in order to keep the index of the formulation constant. In all cases, foams with a density of 2.1 pcf (Table 4) were obtained. The influence of the reactivity of the formulation was quite similar. The rise time of all formulations was between 150 sec and 160 sec. The open cell content, measured in mm water column (the lower the value the more open the foam), shows only slight differences. All non-reactive flame retardants have a similar air flow compared to the foam without flame retardant, whereas the use of the reactive flame retardant RFR5 tends to close the foam a little bit more. The addition of non-reactive flame retardants has a plasticizing effect on the foam expressed in a reduction of the CLD values. The effect slightly depends on the type of flame retardant used. The foam containing the reactive flame retardant RFR5 shows the lowest plasticizing effect, proving that the flame retardant is reacted into the polymer matrix. The compression sets of all foams were in a similar range. Foams were tested according to MVSS 302 in order to determine the efficiency of the contained different flame retardants. 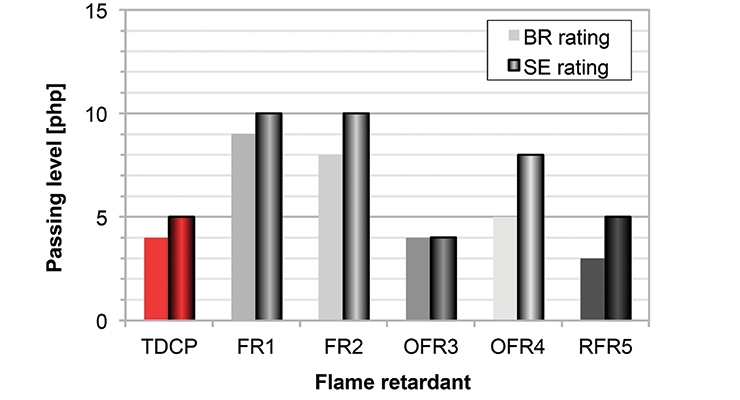 In a first series, the amount of each flame retardant to achieve a BR classification was measured. In a second series, the passing levels to get a SE classification were determined. 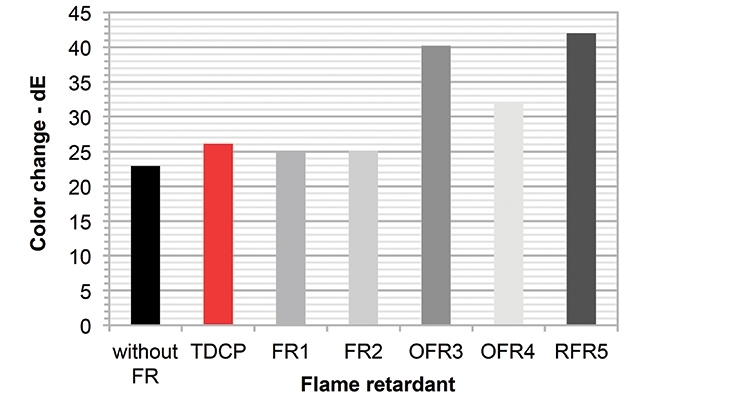 The test results (Figure 1) point out that only the oligomeric flame retardant OFR3 and the reactive flame retardant RFR5 are more efficient than the benchmark TDCP in this type of foam. In all other cases, higher dosages were needed to achieve the corresponding classification. 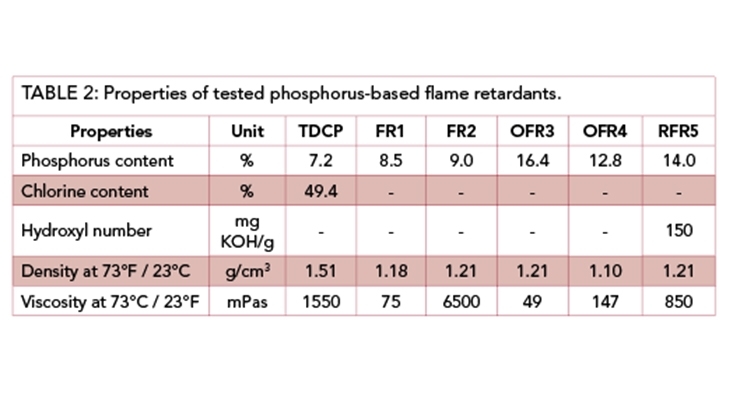 In general, the flame retardant efficiency of the non-halogenated flame retardants corresponds with the phosphorus content (the higher, the more efficient). Another important criterion, especially for the automotive industry, is the contribution of flame retardants to the emission of foams. Different test standards are used by the automotive industry to measure emissions. In a first step the so called fogging (fogging A and fogging B) values of foams containing 6 php flame retardant were measured according to DIN 75201. In general, fogging A (Figure 2) and fogging B (Figure 3) measurements show more or less the same tendencies. All flame retardants contribute to the fogging, whereas benchmark TDCP has the highest contribution. 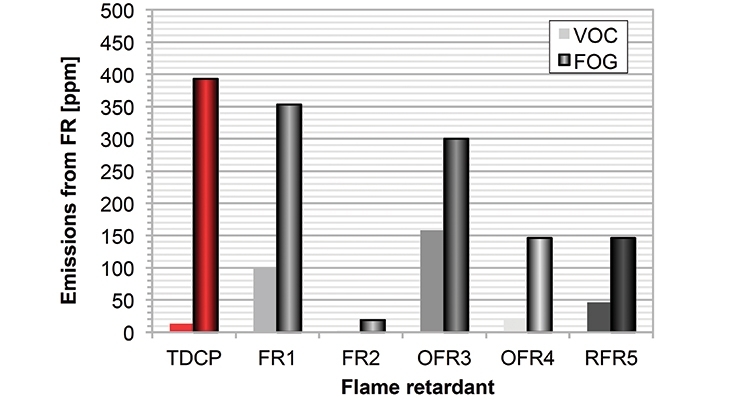 All other flame retardants offer a lower fogging, whereas FR2 and OFR4 show the lowest fogging values. The reactive flame retardant RFR5 also contributes to fogging despite the fact that it should be incorporated into the polymer network. In a second step, the emissions of foams containing 6 php flame retardants were analyzed in a static head space method according to VDA 277. The foams were heated for 5 h at 248 °F/120 °C and then the emissions were measured by gas chromatography (GC) and expressed as Total Volatile Organic Compounds (TVOC). The test results (Figure 4) prove that flame retardants contribute to the emissions of foams depending on their chemical nature. Foams containing TDCP, FR1 or OFR4 show only a minor impact on emissions, whereas FR2 or OFR3 have a higher contribution to emissions (no data were determined for foams containing RFR5). Finally, the emissions of foams containing 6 php flame retardants were measured in a dynamic head space method according to VDA 278. The foams were heated for 30 min at 194 °F/ 90 °C (VOC value ) and then for another 2 h at 248 °F/120 °C (FOG value). The volatiles were collected and analyzed by GC. Foams containing TDCP show a low VOC value but a high FOG value. The oligomeric flame retardant OFR4, as well as the reactive RFR5, has low VOC and low FOG values. The non-reactive FR2 contributes least to foam emissions. On the other hand the VOC values of foams with FR1 and OFR3 are higher than of foams with TDCP, but the FOG values of these foams are lower than foams containing TDCP. It is known2 that flame retardants can contribute to the discoloration (or scorching) of flexible PU foams depending on their chemical nature and the type of formulation. This effect can be simulated in the lab by an oven method.3 The color change of foams containing 6 php flame retardant was analyzed after aging the foam for 3 h at 356 °F/180 °C in an oven. Test results (Figure 6) demonstrate that flame retardants contribute to the foam discoloration. Foams containing TDCP, FR1 and FR2 only show a minor effect, whereas OFR3 and RFR5 have a higher impact on discoloration. Foams with OFR4 offer a medium impact. The results fit with former studies4, claiming that alkyl phosphates tend to have a higher propensity to discoloration than aromatic phosphates. Flexible PU foams for automotive applications have to pass various aging tests including high temperature and humidity aging. As a first step, the flame retardant properties of all foams after aging were evaluated. Therefore, the polyether foams were aged in a fan oven for 7 days at 284 °F/140 °C as required by DBL 5450. The test results listed in Table 5 show that the flame retardant properties of all tested foams do not deteriorate after aging. In fact, foams containing FR2 and OFR4 feature a slightly improved performance expressed in a better MVSS classification. In addition to thermal aging tests, PU foams for automotive must also pass accelerated humidity aging tests simulating the aging of foams under high humidity conditions. The test conditions are not uniform and differ from OEM to OEM. 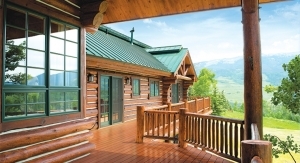 In this evaluation, humidity aging was tested as required by DBL 5450. PU foams were aged in 3 cycles for 5 hours at 248 °F/120 °C. The mechanical properties were measured before and after aging. 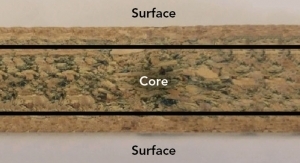 The test results summarized in Table 6 demonstrate that all foams changed their mechanical properties after humidity aging. All PU foams lost hardness on a similar scale (approx. 48%) except the foam containing the reactive flame retardant RFR5 featuring a higher CLD loss (-59%). The compression set is impacted by the humidity aging too. All foams show an increase in compression set. In this case, the increase differs between 91% for the foam with OFR3 and 233% for the foam containing the reactive RFR5. The impact on tensile strength shows indifferent results. Foams without FR or with TDCP, OFR3 or FR1 have an increase in tensile strength whereas foams with FR2 and OFR4 show a slight decrease in tensile strength. The foam containing the reactive RFR5 has the highest loss in tensile strength. As far as the elongation is concerned, all foams have an increase in elongation of approximately 100% except the foam with FR2 showing 58% increase and the foam with the reactive RFR5 showing the lowest increase of 11%. Overall, the test results demonstrate that humidity aging has a significant impact on the mechanical properties of PU foam. In addition, the type of flame retardants used also affects the aging performance of the foam, whereas the reactive flame retardant RFR5 has the most significant effect. Hereby, the impact of flame retardants varies by mechanical property. Besides polyether based PU foams, foams based on polyester polyols are also used in automotive applications. Thus, similar tests were performed with a standard polyester foam formulation (Table 7). The formulation is based on a blend of TDI 80 and TDI 65 and contains typically 6 php flame retardant. All tested foams had a density of approx. 1.8 pcf (Table 8) except the foam containing the reactive RFR5 that comprised a higher density of 2.1 pcf. The impact of the different flame retardants on the reactivity of the formulation was quite similar and close to the reactivity of the foam without any flame retardant. The rise time was within a range of 71 seconds to 77 seconds. In all cases a more or less closed foam was obtained, expressed in a > 350 mm water column value for all foams. The plasticizing effect of the individual flame retardant is less pronounced compared to the results found in polyether foams. A foam containing OFR3 has the highest reduction of the CLD value, whereas the use of the reactive RFR5 even shows an increase in foam hardness. An opposite effect can be seen in the compression set of the foams. The foam with the reactive RFR5 has a significant higher compression set with 19.5% compared to all other foams with values between 5.0 and 6.8%. 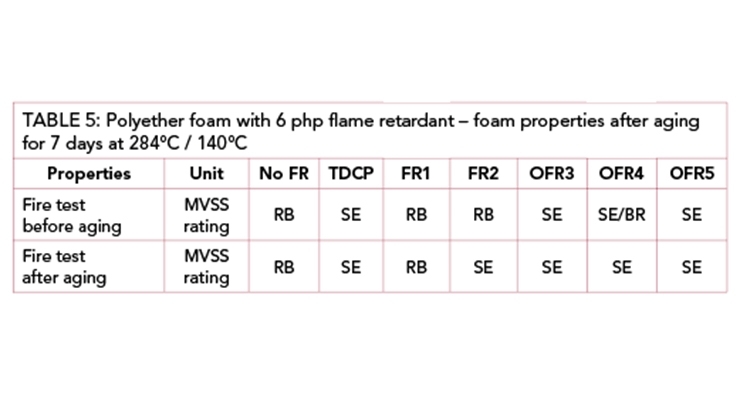 The efficiency of the different flame retardants in polyester foams was again tested according to MVSS 302. The amount of flame retardant needed to achieve a BR classification was determined first. Secondly, the passing levels to get an SE classification were measured. 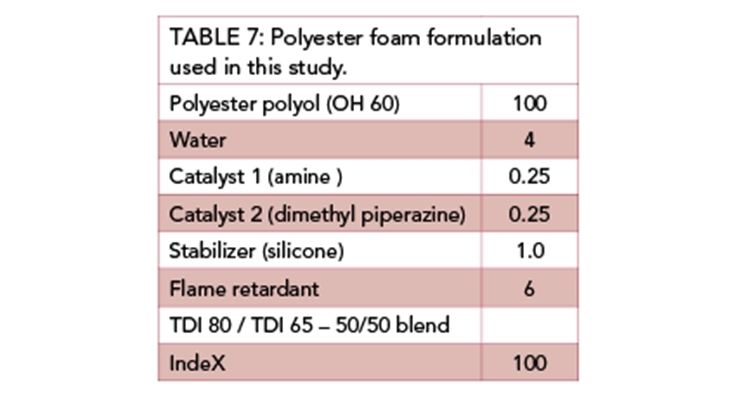 The test results (Figure 7) point out that overall the performance of the tested flame retardants in polyester foams is similar to the performance in polyether foams. 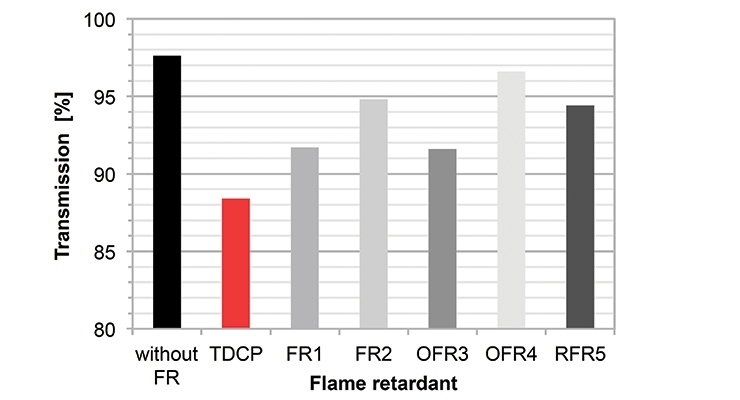 The oligomeric flame retardant OFR3 is more efficient than the standard flame retardant TDCP. The reactive flame retardant RFR5 has a similar efficiency to TDCP in this type of foam. All other flame retardants require a higher dosage in order to achieve the corresponding classification. In general, the efficiency of the non-halogenated flame retardants corresponds with the phosphorus content (the higher, the more efficient). All polyester foams were aged in a fan oven for 7 days at 284 °F/140 °C. The flame retardant properties were tested before and after high temperature aging. 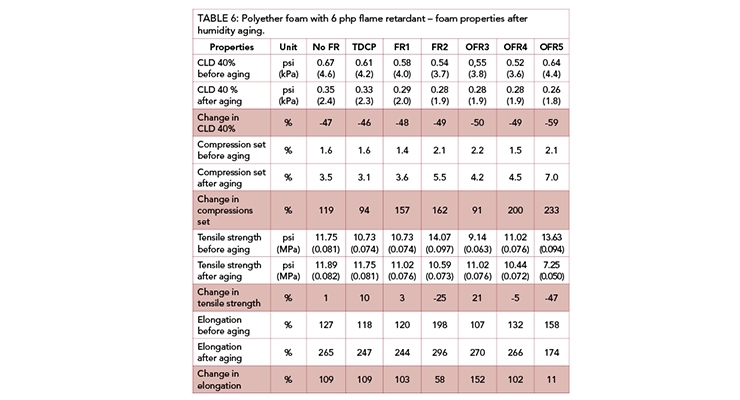 The test results summarized in Table 9 demonstrate that the flame retardant properties of the most tested substances do not deteriorate after aging. In fact, foams containing OFR4 feature a slightly improved performance expressed in a better MVSS classification. On the other hand, foams with TDCP or FR1 only achieved a lower classification after aging. Polyester PU foams for automotive applications must also pass accelerated humidity aging tests. The conditions are not as severe as for polyether-based foams because of the inherent inferior hydrolytic stability of polyester foams compared to polyether foams.5 Thus, all polyester foams in this study were aged for 3 h at 221 °F/105 °C in an autoclave according to ISO 2440. The mechanical properties were measured prior and after aging. The test results listed in Table 10 point out that all foams changed their mechanical properties after humidity aging. 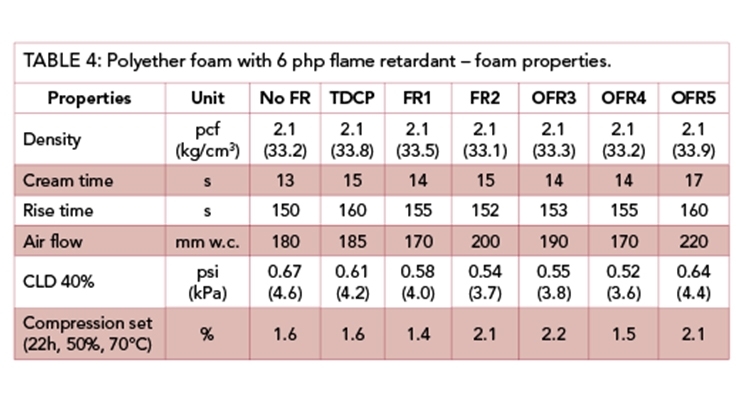 All PU foams show a reduction in hardness on a similar scale except the foam containing the reactive flame retardant RFR5 featuring a slightly higher CLD loss with 27%. The compression set of all foams increased after aging. 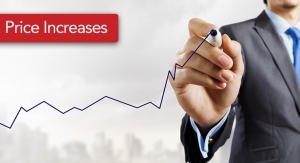 The increase differs between 38% for the foam without FR and 92% for the foam containing OFR3. The effect of humidity aging on tensile strength is inconsistent. 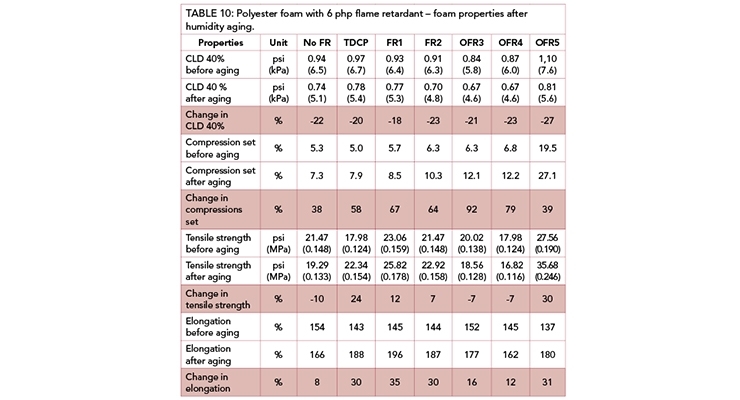 Foams containing TDCP, FR1, FR2 and RFR5 have an increase in tensile strength, whereas foams without FR or containing OFR3 and OFR4 show a decrease in tensile strength. With regards to elongation, all foams feature an increase in the correspondent value. The increase varies between 8% for the foam without FR and 31% for the foam containing the reactive RFR5. In general, the test results prove that humidity aging also has a significant effect on the mechanical properties of polyester foams depending on the type of used flame retardant. As seen for polyether foams, the impact of flame retardants depends on the tested mechanical property. The presented information shows that there are new phosphorus-based flame retardant solutions based on different concepts, which can be used in flexible PU foams for automotive applications. 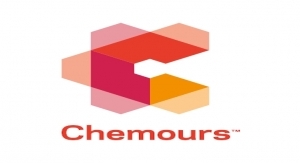 The flame retardant performance mainly depends on the phosphorus content and less on the chemical concept of the compound being an additive, polymeric or reactive one. 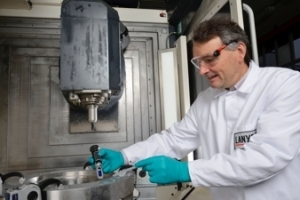 On the other hand, it is obvious that the concept of incorporating a reactive compound into the polymer chain has a higher impact on the foam properties, including aging, compared to additive or polymeric compounds. The limits of the different concepts become apparent in the contribution to foam emissions. 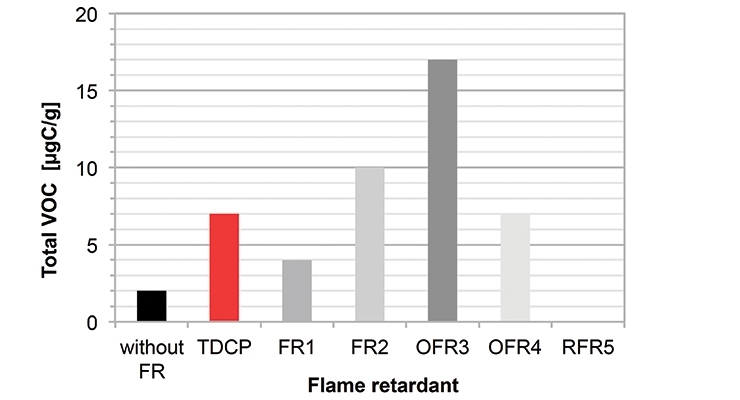 Additive flame retardants, such as TDCP and FR1, feature a higher contribution to foam emission compared to oligomeric or reactive flame retardants due to their inherent higher volatility. An exception is FR2, showing low emissions, because of its high molecular weight. Furthermore, the fogging/emission test results demonstrate that the relative performance of different flame retardants also depends on the test method used. TDCP, a standard flame retardant for flexible PU foam, offers good performance in DIN 75201 fogging test, but features only a medium performance in more stringent emission tests VDA 277 and VDA 278. 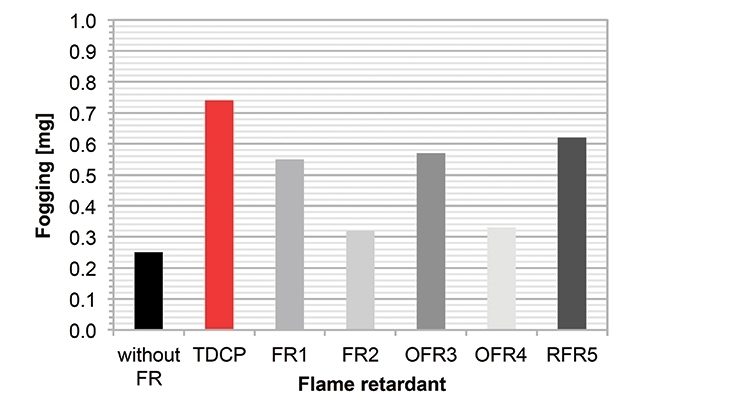 FR1, a standard phosphorus-based flame retardant, shows a good performance in VDA 277 but an inferior performance in VDA 278. 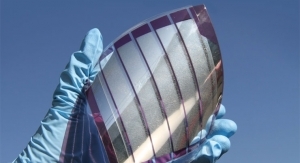 It is obvious that further criteria also play a role in the emission performance, such as thermal stability and purity of a substance. 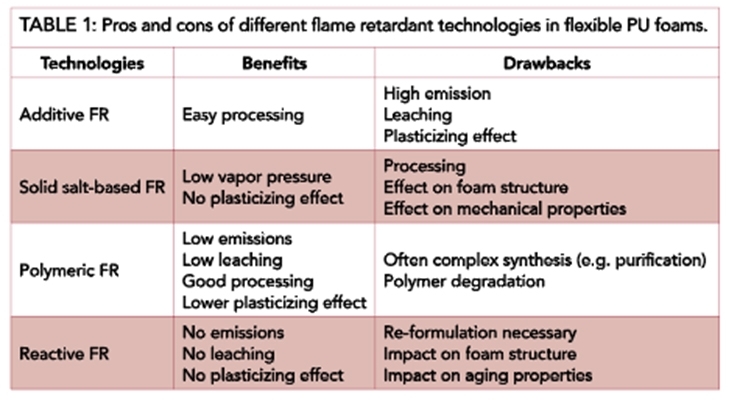 The different concepts have no significant impact on the scorch contribution of flame retardants in flexible foams. Here the chemical nature (aromatic versus aliphatic) of a substance dominates the contribution to foam scorch. 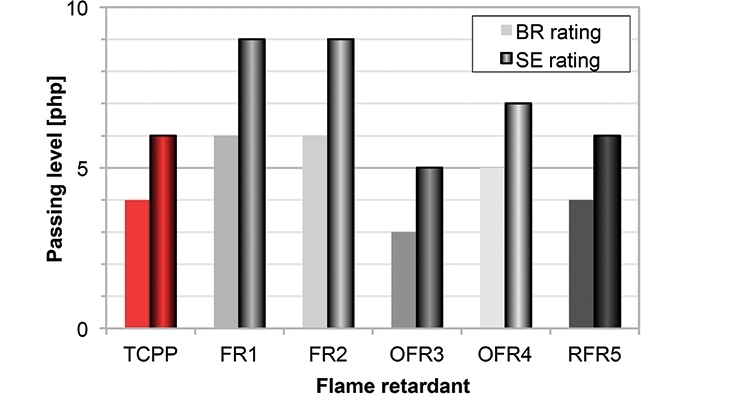 The test results for thermal aging prove that oligomeric and reactive flame retardants can match the performance of additive flame retardants or even outperform them. The data for humidity aging show inconsistent performance depending on the mechanical properties tested. In this performance no concept is favored except that the reactive flame retardants feature a slightly lower aging performance compared to additive and oligomeric solutions. 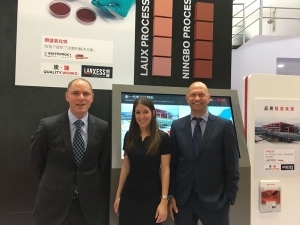 We would like to thank Ms. Vera Mushold and Mr. Uwe Kunert from LANXESS in Germany for preparing and characterizing all foams as well as for running the fire tests. 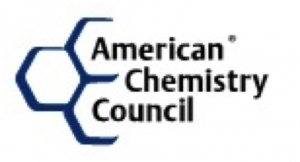 This paper was originally presented at the 2017 Polyurethanes Technical Conference hosted by the American Chemistry Council’s Center for the Polyurethanes Industry (CPI). 4 Levchik S.V. ; Luda M. P.; Braco P.; Nada P.; Costa L. “Discoloration in fire retardant flexible polyurethane foams”, Journal of Cellular Plastics 41, 2005, 235-250.